Amber Heard’s Engagement Ring – Dazzling! Amber Heard’s first engagement ring from Johnny Depp features a five carat round diamond at its center. The main stone is slightly raised and is beautifully offsest by accent diamonds, the perfect match for Amber’s classic beauty and elegant sense of style. Today, the ring is worn by Depp, who presented Heard with a slightly smaller ring, which features a diamond-embellished bezel set on a band with scrollwork that gives it a vintage feel. Like Amber Heard’s engagement ring, this custom diamond ring from Brilliance features a magnificent round stone at its center. Slightly elevated, with diamonds on its prongs and additional stones on the sides, it has an elegant, feminine appearance with loads of bright sparkle. While this Amber Heard inspired engagement ring is set in platinum, it would also look outstanding in another a setting such as palladium or white gold. Born April 22, 1986, Amber Heard is an American model and actress. She made her film debut in the acclaimed sports drama Friday Night Lights alongside actor Billy Bob Thornton. After taking on small roles in Alpha Dog and North Country, Heard won a leading role in All the Boys Love Mandy Lane. She also appeared in Hidden Palms on The CW. Amber’s big breakthrough arrived in 2008, with roles in Pineapple Express and CCT Back Down. She received the coveted Breakthrough Award at Young Hollywood Awards, and received even more acclaim for appearances in films such as The Joneses, Zombieland, The Stepfather, and The Informers. She starred alongside Nicholas Cage in Drive Angry, and she won a Spotlight Award at the Hollywood Film Festival for her role alongside now-husband Johnny Depp in The Rum Diary. Amber Heard has recently enjoyed roles in Machete Kills, Paranoia, and 3 Days to Kill. In the October, 2009 issue of Teen Vogue, she described her role opposite Johnny Depp in The Rum Diary as “the best experience of my life.” The two began dating in 2012 and were married on February 4, 2015. Heard’s natural beauty has won her several spots in magazines’ ‘Sexiest’ and ‘Most Beautiful’ lists. She doesn’t seem to mind the attention, however at the same time, it doesn’t stop her from taking the lead in social activism causes such as the abolition of slavery worldwide. She is a supporter of Amnesty International, Girl Up United Nations Foundation, The Art of Elysium, and Habitat for Humanity. Did you know that Amber Heard is a huge fan of muscle cars? She recently appeared on the UK show Top Gear, discussing her love of big motors and guns. She also revealed that she used to love line dancing in Texas bars. What Our Experts Have to Say about Amber Heard’s Engagement Ring. Like nearly all celebrity engagement rings, the one Amber Heard wears is over the top. The sparkling diamond at its center is smaller than the five-carat diamond in the mangagement ring Johnny Depp started wearing when the two announced their upcoming nuptials in 2014, but it’s still well above average. The setting, which features numerous accent diamonds, is absolutely stunning, adding even more pizzazz to the ultra-glam engagement ring. 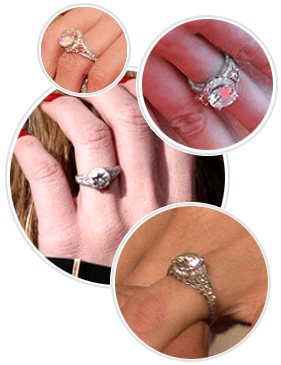 It’s commonly believed that custom engagement rings are too costly for everyday people to enjoy. The truth is that with the easy online tools found at Brilliance, you can design a custom engagement ring that’s similar to the one Amber Heard received from Johnny Depp. These tools, along with a little guidance from our friendly team of diamond experts, can also help you take the elements you like most about Amber Heard’s engagement ring and incorporate them into a completely new design of your own. So celebrate your life and love in style! With Brilliance by your side, it’s easy and affordable to create a ring that expresses your love for one another perfectly.